Here at arfoodjobs.com, our main goal is to connect employers with the very best talent Arkansas has to offer, whether that’s servers or cooks, general managers or executive chefs. The first step of getting to know you—and helping others find you—is through your resume. Our site has a unique online resume system, allowing you to apply directly to jobs without creating a separate document in a word processing program. If you don’t already have a resume, or if you don’t think yours has the design it needs, it’s just the trick. If you already have a resume, we recommend you still create an online one and attach your existing file. Employers can search our online resumes for keywords and experience they’re looking for, and this search does not reach into your attached files. Ready to get started? Let’s make an online resume! If you are registered with arfoodjobs.com, please log in before filling out the form. Not registered with us? No sweat. Filling out the form will get you automatically registered as a user of the site. We’ll send you a password to log in with in the future, which you can change anytime. If you happen to have an updated LinkedIn profile, click the Import from LinkedIn box to populate your information with that. You may have to tweak it a bit afterwards, but it’s a fast way to get things going. Fill in your name and email in the appropriate spaces. Where it says “Professional Title,” type either your current position title or a general title that describes you: “Experienced Line Cook,” “Culinary Student,” or the like. Under “Location,” type the city where you live now. If you are willing or trying to relocate, please say so in the “Resume Content” section coming up. The photo is completely optional, but it can be a good opportunity to show professionalism. Consider a well-lit, professionally-posed photo of yourself. If you are applying for a culinary position and you have a chef coat, wear it. (Skip the hat.) 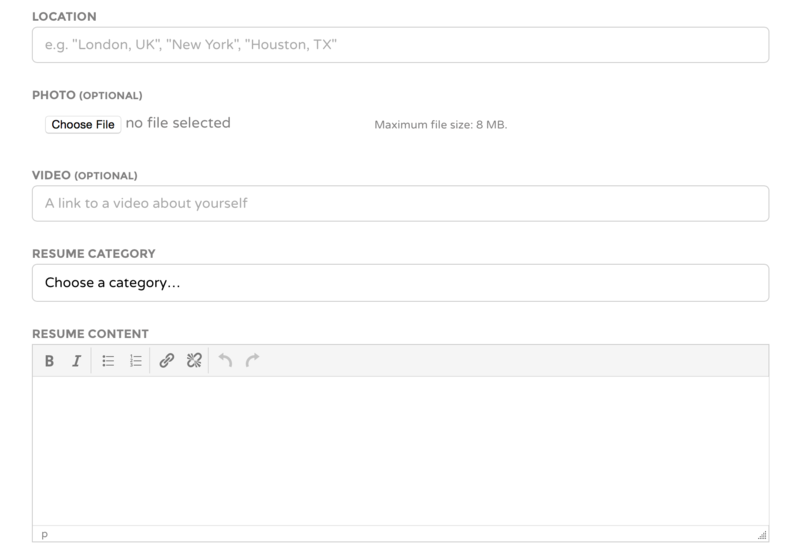 Next you can add the URL of a YouTube or similar video of you introducing yourself or of you on the job. This can be a great way to introduce yourself, but can also be a negative if done poorly. Have a trusted mentor (or one of us) check it out before attaching. Videos are also optional and can be skipped or added later. Under “Skills,” create a list of keywords or short phrases separated by commas that describe you or the way you work. “Knife Skills” and “Professional” are common and excellent choices. Avoid phrases longer than two or three words, and do not use phrases that include commas. If you want your online resume to look super organized, you can use the “Education” and “Experience” sections to add these details. (If you copied and pasted your resume in the Resume Content area, this is optional.) Begin with the most recent place of education or experience. Include as much detail as possible, then click “Add Education/Experience” to add the next. 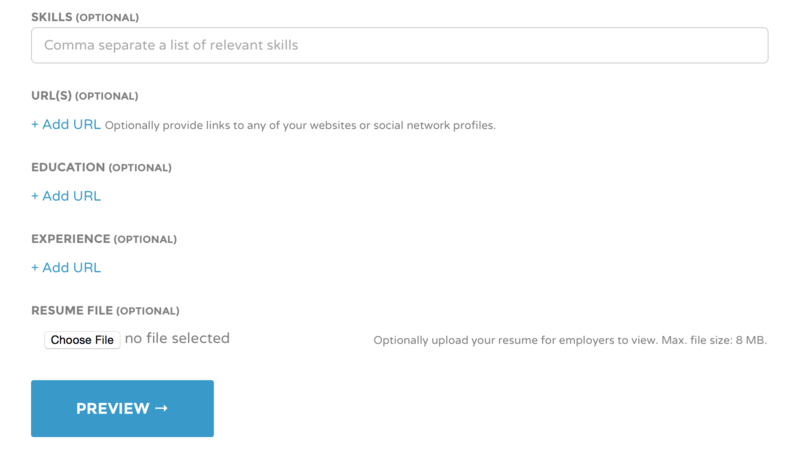 If you have an existing resume, it’s helpful to have it handy to fill this section out. You can even copy and paste into these sections, you just may want to eliminate any extra formatting from your word processing version. Where it says “Resume File,” attach your existing resume document if you have one. This is useful because employers like having something they can easily print off or share with colleagues, in addition to the convenience of the online resume. Most file formats will work, including Word and PDF. If at all possible, use PDF, as it works best in our system. Most word processing and design programs can export to PDF, or you can choose “Print” and then “Save as PDF” in your print dialog box. IMPORTANT NOTE: Please save your resume file with the file name as follows: Your Full Name + Resume. Example: John Smith Resume.pdf. This helps our employers sort through all those files they’ve downloaded to fill a position. Here, you can see how the employer will see your resume. It is EXTREMELY IMPORTANT that you not navigate away at this point, because it’s not saved until you hit “Submit Resume.” If something’s not right, click “Edit Resume” to fix it, then “Preview” again to come back here. Click “Submit Resume” when all is like you wish. Now, when you apply to a job, you’ll have the option of using this resume rather than submitting a separate one. Your resume(s) are listed at My Account > Manage Resumes. Here, you can click your resume and make any changes or updates needed. 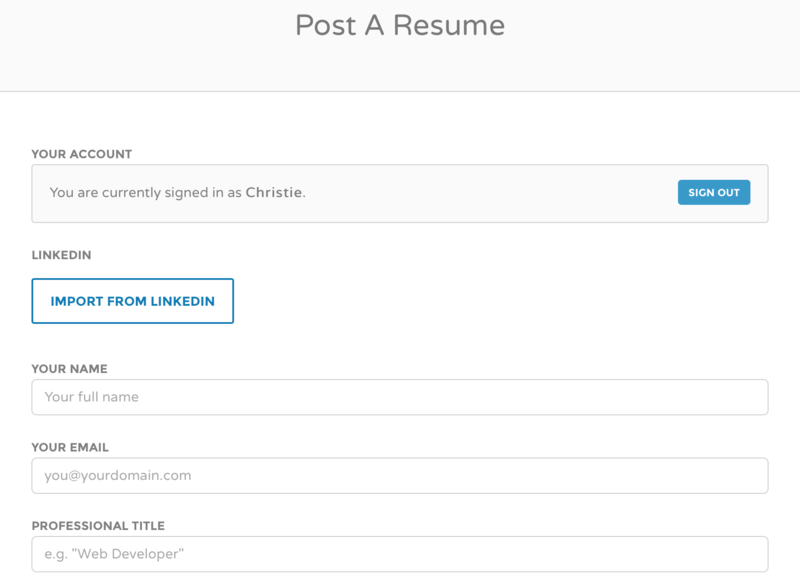 You can post a resume for networking purposes even before you’ve started your job search. This is perfect for culinary and hospitality students just starting to get their names out there. Online resumes are visible to all employers advertising on our site. If you’d rather that your current employer didn’t know you were looking, maybe skip it for now and apply to jobs using your standard resume file. Grammar, punctuation and spelling matter, even in an online resume. Capitalize your name (that one surprises us daily) and pay attention to details. If you’re not sure, get the help of a trusted instructor, mentor or friend who’s good at that sort of thing. If you have any problems or questions, feel free to contact us and we’ll help you post your online resume.